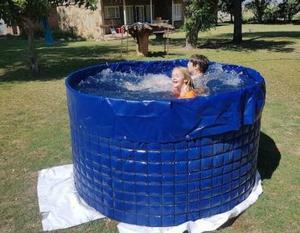 Rainbow Tarps and Linings Mesh Port-a-Pools are a cost effective way to own a pool and stay cool this summer. These tried and tested vinyl pools have been around since the early 1960’s and have been proven alternative to expensive fibreglass and cement structured swimming pools. The pools come in a kit form and are easily transportable and DIY installed. The pools come with a 40mm outlet and tap to drain and clean. A simple flat pool cover is recommended to save on water, chemicals and to keep the pool clean and safe. A small chlorine floater is all that is needed per 4 to 6 weeks to keep the water clean in summer if a pool cover is usd and only 1 small chlorine floater over the winter season.